Info "Swimming is safer with a buddy!" Sync & Swim! 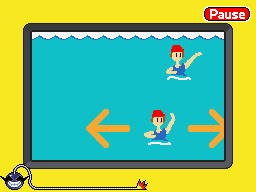 is one of Jimmy T.'s microgames in WarioWare: D.I.Y. The game is based on the sport of synchronized swimming, with 'sync' being both a shortened word for 'synchronize' and a play on the word 'sink,' referencing the phrase "sink or swim." The point of the game is to follow the leader's movements by going in the same direction as she is going. The player has to tap the direction the leader is going. If she's going right, the player has to tap the right arrow and vice versa. About halfway through though, the leader switches directions. If all directions are followed, the game ends in a win, however, if the player presses the wrong arrow or takes too long to make a choice, the player automatically loses. This page was last edited on March 29, 2019, at 18:05.